The unknown dead were the unwanted in Joplin just a few years after the turn of the century. For those who perished in the city, without anyone present to claim their body, there were several cemeteries to be laid to rest. For those unfortunates who died without any present to witness to their name or identity, a specific place in the earth was reserved. It was located in Potter’s Field, a traditional name for burial spots for the poor and forgotten. Joplin’s Potter’s Field was found at the western fringe of Joplin’s westernmost major cemetery, Fairview Cemetery. There the dead rested beneath a landscape dominated by mines, from the mining houses to the chat piles. It was a barren and lonely place. 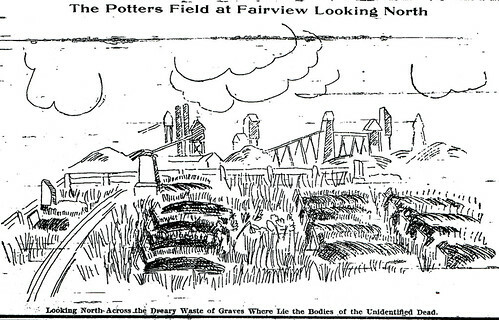 A sketch of Joplin's Potter's Field. The Joplin News Herald reflected on the visitors to the pauper’s cemetery, mothers in search for sons, brothers looking for brothers. There was one exception, the News-Herald reported. Husbands rarely, if ever, sought their wives in Joplin’s potter’s field, though it was surmised that sometimes it was husbands who sent their wives there to sleep amid the mines.